Beautifully finished with oak walls, rusty tin ceilings and smooth tile and hardwood floors, the Lodge adjoins the Event Hall in the barn and consists of an open den and dining room, large kitchen, and eight private guest rooms. Enjoy comfortable leather furniture, a cozy gas wood stove, a big screen TV, and a large dry erase board in our open den and dining area. Lounge in a wooden rocking chair on the front porch or picnic on the side porch with our gas grill and patio tables. The large kitchen is a favorite with groups who want to hold meetings with snack service or catering. The kitchen has a 5 burner gas range with an oven, a microwave, dishwasher, large refrigerator, commercial coffee maker, dinnerware for 24, pots, pans, serving bowls, and utensils. There is a large pass-through window from the kitchen to the dining room to make meal service easier. The dining room has counter height tables and padded chairs for twenty-four people. There are four guests rooms downstairs and four upstairs. The upstairs rooms walk out to a balcony overlooking the Event Hall and the downstairs rooms adjoin the open dining room and den. Each room sleeps two people, has a sink vanity with mirror, and shares a bathroom with the adjoining room. Six of the rooms have one queen bed each, and two rooms contain two twin beds. All rooms have central heat and air conditioning and are complete with bed linens and towels. The lodge sleeps up to seventeen people. 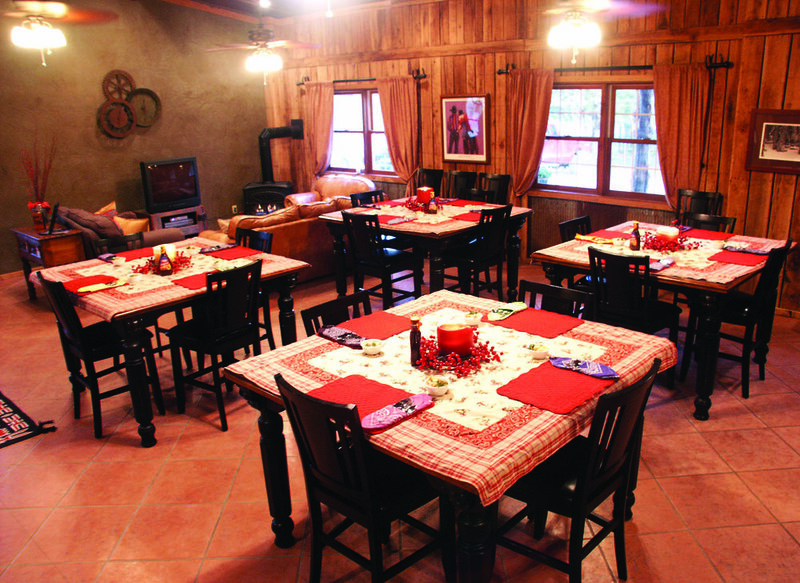 Call 870-424-7433 to book your tour of the ranch!